Last week I told you guys why I’m in the process of swapping our guest room and office, and we briefly chatted about the major problems with the current space (you can catch up here). 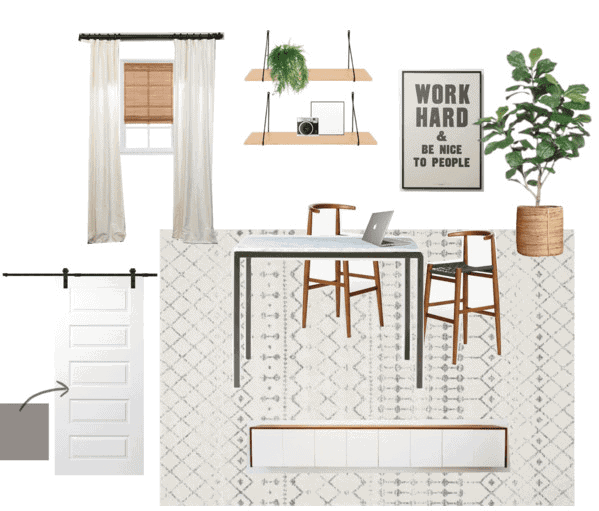 Today, I’m sharing the design plans for our “new office” with a mood board and a few notes about my plans. I love putting together a mood board before I start painting, buying furniture, or making any changes in the space. It’s great to see a snapshot of the entire space before taking any action. Putting all of the pieces that I’m loving together gives me a clear direction and far more confidence to start the space. 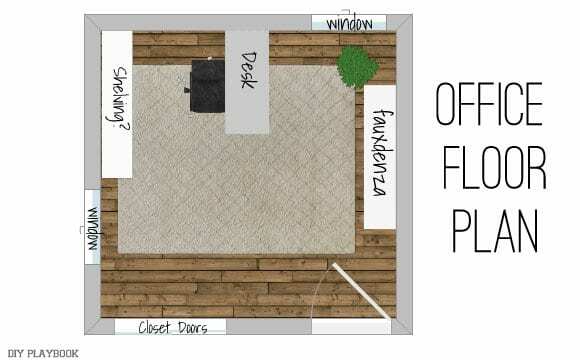 If you’re tackling a new space, I would HIGHLY recommend doing this if you’re having trouble visualizing the look. We shared this tutorial on making a mood board last year to help walk you through the process. <— The best part is that it’s super EASY and you don’t need to have any special software on your computer or any photoshop-like skills. White Paint: You guys know we’re all about neutral paint around here but I’ve never experimented with WHITE and I’m actually really excited to try. I’ve seen so many white rooms I’ve been loving lately and thought this bright space could be the perfect opportunity to test out the look for myself. (And see if I just love the look online or if I really love living with it too). 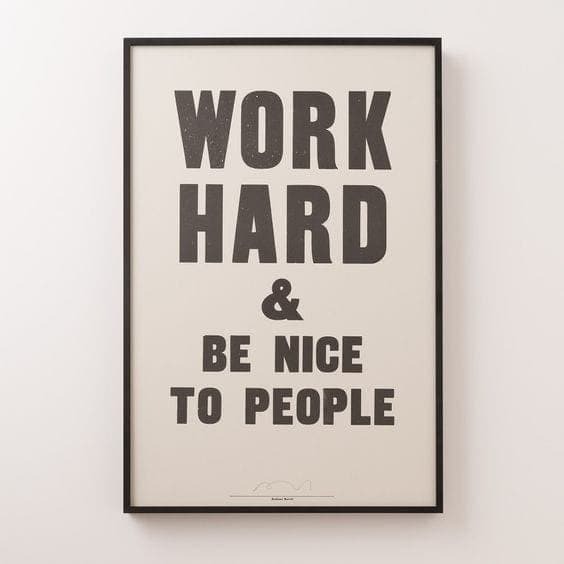 Meaningful Art: I’ve been eyeing this “WORK HARD & BE NICE TO PEOPLE” Art for YEARS… yes YEARS! It may be my all time favorite piece of art on the internet and I knew that it was finally time to splurge on it since I love it so much (and the message is so meaningful to me). The art is more than I usually spend but like I’ve been mentioning all year, I want quality over quantity and would rather spend more money on one thing I love than a lot of little pieces on sale. 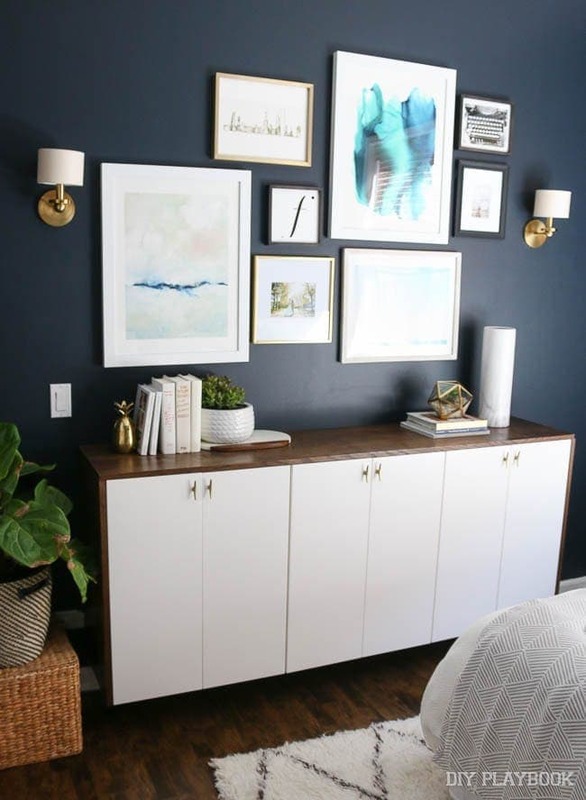 Fauxdenza: I love both Casey’s fauxdenza and the fauxdenza we built for the Lowe’s Fall Makeover. Ever since Casey installed hers, I knew I wanted to try one in our home but wasn’t sure where to make it work. Now that this space is a blank slate, I think a fauxdenza will be the stylish storage we need. But I definitely want to put my own spin on this DIY, so it’s not exactly the same as the others. Tall Desk for 2: I’ve been intrigued about a standing desk for a while. I have some neck problems (aka too much time on the computer not enough time at the gym) and thought that working towards a standing desk could be a fun… and a healthy challenge in 2017. Plus, I liked this taller table because it could fit both Matt and I (or me and Casey) so we can work together in the office without having a huge footprint in the room. DIY Barn Door: This is the component of the room that I’m most excited about but also most nervous about. 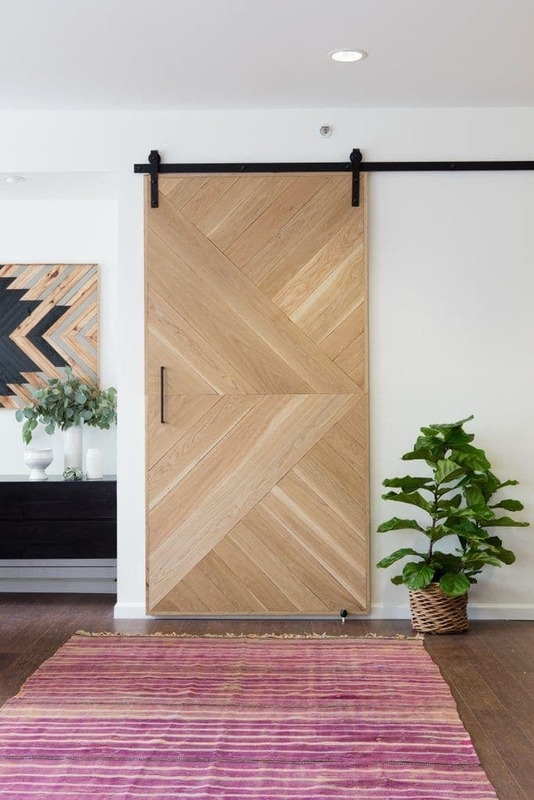 I have to do a lot of research before tackling this project but I do love the idea of getting rid of the two current doors and replacing them with one large sliding door. We have access to our crawl space in this closet and the current setup is not working out too well. I think the large door will look great while offering more room for access into this space. These are my ideas for now. Of course, this room will definitely be a work in process but now that I have more of a plan, I’m excited to get started. First on the to-do list? Paint!! If all goes as planned, stay tuned some time next week with white paint updates!